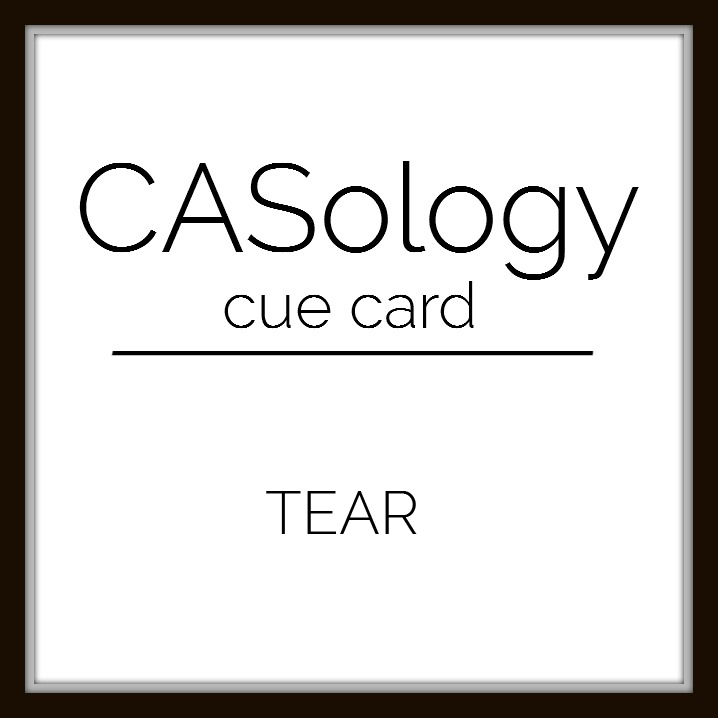 This week's CASology Cue Card is Tear. I went for cry rather than rip and made a sympathy card. CAS design works well for Sympathy cards - for this one I let the sentiment (which is quite large) stand on its own, with a row of tiny pearls for an addition of (hopefully) elegance. This old "Verses" sentiment is one I often use for sympathy cards. 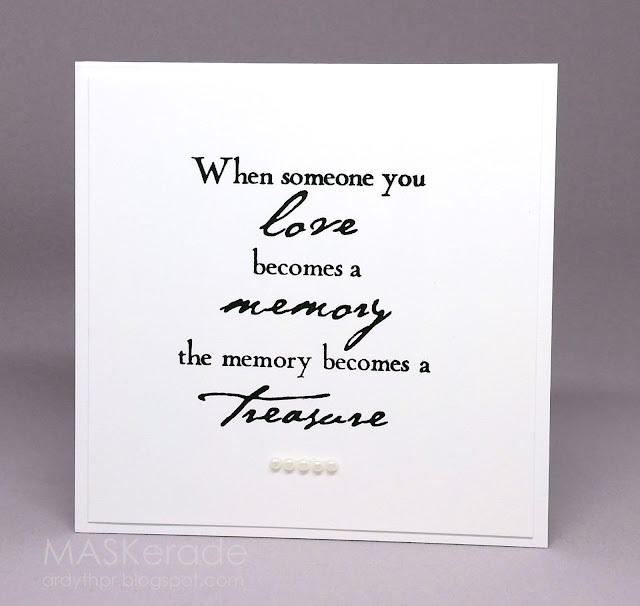 What a touching and beautiful card for someone who has lost a dear and beloved one! I need several myself, so this is perfect! Love it, Ardyth! Hugs! Love the way you have the sentiment taking center stage here. The pearls are a wonderful embellishment. It's a perfect sympathy sentiment - I love the mixed fonts - and the pearls are most definitely an elegant touch. 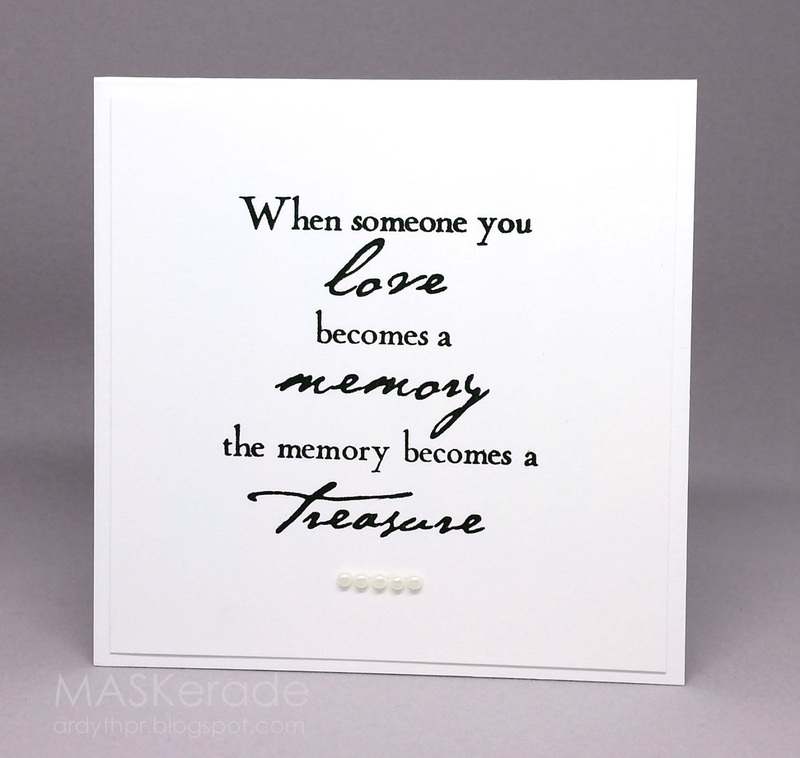 This is a wonderful sentiment and translates to a thoughtful card! The pearls are the perfect understated embellishment! 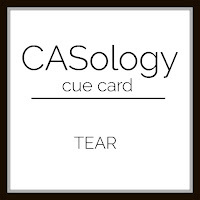 Your card is beautiful in its simplicity. I loved it immediately because I have this Verses sentiment, too; it was one of my first sympathy sentiments when I started stamping in earnest. Beautiful. That sentiment deserves to take center stage. Amazing sentiment, and card -- love that you let it speak for itself! This is wonderful Ardyth - timeless elegance in a card! What a wonderful sympathy card with such a touching sentiment, Ardyth!!! Love the pearls you added!!!! This is perfect. Simply perfect. Hello Ardith: This sentiment deserves center stage, it's touching and so beautiful, there is no easy way to send condolences but this card surely deliver a sweet and sincere message. I too, don't have to many beautiful sentiments for this sad occasions and yours is simply lovely.